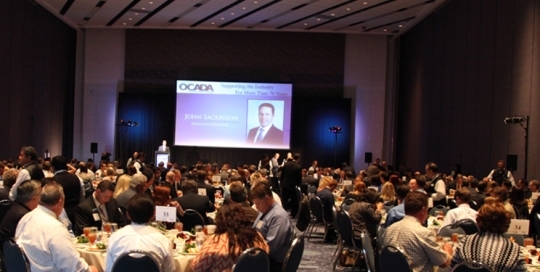 The Orange County Automobile Dealers Association hosted their annual meeting and auto show preview event highlighting the strengthening of the auto industry in Southern California and progress in providing valuable scholarships to young technicians attempting to enter the automotive industry. The Showpros Group was called on to produce the event featuring a keynote by decorated Navy Seal, Marcus Luttrell. 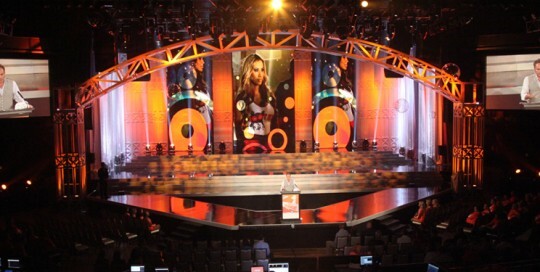 For the event The Showpros handled staging, crew, lighting, sound, projection (using an 11′ x 16′ screen), and show control. Content Development, Design, Production, Showtime! 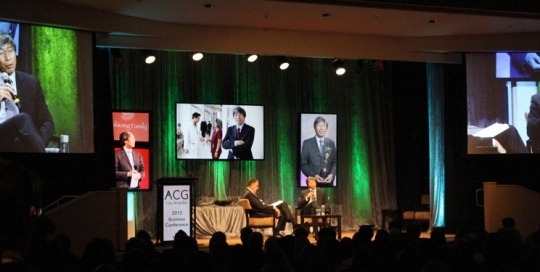 ACG Los Angeles took over the Beverly Hilton Hotel for their annual, two-day, deal-flow and finance conference. The sold-out conference spanned most of the hotel’s ballroom and meeting spaces for general sessions, keynotes speakers, including President Bill Clinton, breakout sessions, and private equity showcase. The Showpros was enlisted by ACG Los Angeles to provide creative services, assist in content development, post-production of media and videos, as well as staging, on-site production crew coordination, staging, lighting, sound, projection and show control. On the main-stage our multi-image set included two ‘7x’14 side screens (HD projection), two “70 LCD displays in vertical, an “80 LCD display on center stage and our Digital Podium – all operating together and separately to reinforce the speakers and panel discussions. Content Development, Design, Photography, Production, Showtime! The Showpros, a premier event production company based in Orange County, CA was tapped by Hooters of America to produce their week-long, national convention at the Hard Rock Casino& Hotel in Las Vegas, NV., which culminated in their annual Hooters International Swimsuit Pageant. As the event producers, The Showpros was tasked with overall leadership and coordination of all aspects of the event, from food and beverage and guest/talent travel and accommodations to event services, conference production, creative services and technical support. The convention included a theatrical roll-out of the new Hooters logo, a day-long trade show, general and break-out sessions, a VIP and general reception, pool party and wing eating contest. 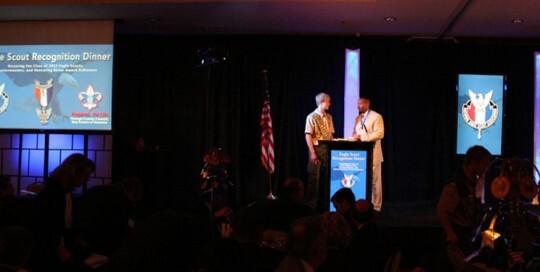 The Showpros, Orange County’s premier event production company, were tapped to produce the annual Eagle Scout Recognition Dinner for the BSA Orange County Council. Attended by more than 400 guests this sold-out event featured the honoring of current and past recipients of the Order of the Eagle Scout. The Showpros worked with BSA prior to the event in creating the right environment for this prestigious evening – and on day-of, managed move-in, staging, lighting, projection, sound and front and back of house. During the live-show our production team worked with the event photographer to assemble a 3 1/2 minute video, a musical collage featuring photos taken at the event. The video was the featured closing for the evening. The Showpros got the call to produce the annual, internal conference for the Commercial Banking practice of California Bank & Trust, a day-and-a-half meeting that included an awards dinner and 3/4 day series of seminars. 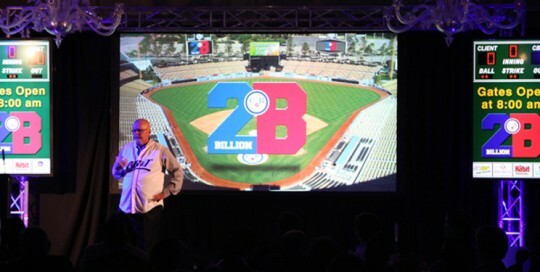 Over the course of two months we helped their executive team develop a “baseball” theme, created logos, art and style guides, shot and produced four, five-minute client testimonials as well as designed the awards and conference sets and managed all portions of the event itself (lighting, staging, show control, photography, sound and projection). 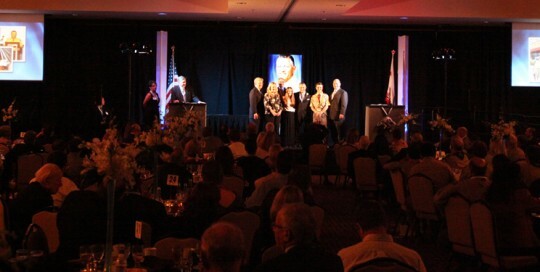 BSA Orange County Council, a 25-year Showpros client, once again asked for our expertise in producing their annual recognition dinner and awards. The event honors their Silver Beaver recipients and other Scouting VIPs. 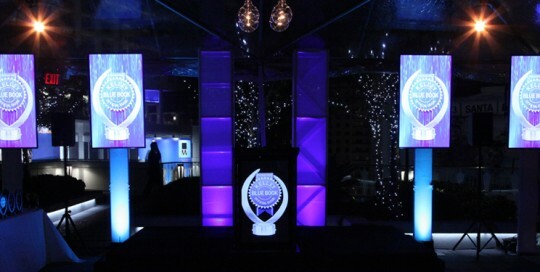 Ahead of the event we worked with BSA to produce the honoree videos, look and feel for the event and show-flow. 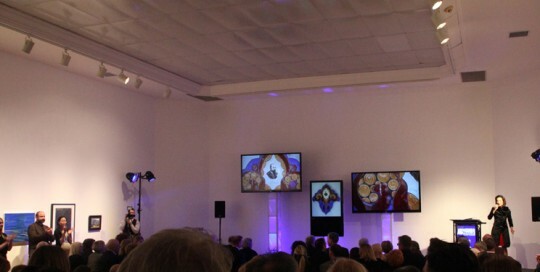 During the live event we provided sound, lighting and visual effects plus show and crew control. The Showpros, Orange County’s premier event production company, got the call to help Laguna Art Museum (LAM) produce their annual art auction followed by a “California Underground Club” themed after-party. The event showcased works of art from over 100 premier California artists such as Charles Arnoldi, Tony DeLap, Laddie John Dill, Manny Farber, Joe Goode, Helen Lundeberg, and Kim McConnel. The three-part event included a silent auction, a live auction and post-auction party. Visual: Two 80″ + one 65″ truss mounted LED screens, controlled via “Watchout” playback system for live auction and special effects, projected special effects in museum entry/registration. Lighting: High-intensity architectural lighting inside and out, wireless par can lighting for the underground club, and stage and podium feature lighting. Sound: Sound reinforcement to four silent auction galleries plus the live auction main gallery/underground club, podium and wireless mic’s, digital mixer and sound engineer. Each year The Kelley Blue Book Best Resale Value Awards recognize automakers’ outstanding achievements in producing vehicles that best retain their value over the first five years (60 months) of new-vehicle ownership. Our role was to help KBB create an exciting and vibrant atmosphere that spoke to the quality of people and automobiles they would honor. In addition to presenting the awards KBB required a highly social space for their VIPs to mingle in a relaxed and inviting atmosphere. Our team produced the multi-HD screen award presentation videos, orchestrated lighting, sound systems, music and provided stage direction and show control.